Indoor air pollution is just as harm causing as is the outdoor pollution. Instead, it can cause more harm to the skin and might lead to allergies and breathing problems like asthma. Computers, air fresheners, cooking, smoking and other such minute things are responsible for indoor air pollution. Since, humans have shifted from stone to this digital age; we have moved from analogue to digital and there are a lot of avenues open for every walk of life. Air pollution is no rocket science that can’t be fought. Although, it can’t disappear but yes, measures could be taken so as to ensure a healthy environment is kept around. 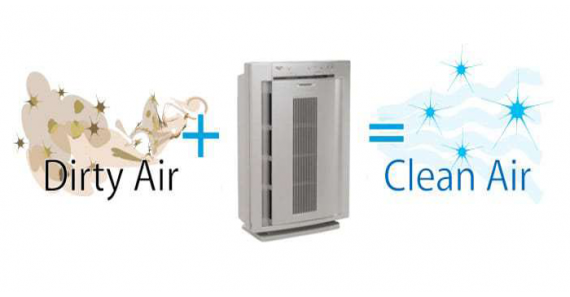 Technology has gifted human race with the ‘Home air purifiers’ that work to clean the air inside homes. Home air purifiers are aimed at removing small particles up to 0.3 microns, a size that is totally invisible to the naked human eye. These air purifiers shouldn’t be confused with vacuum cleaners, since, the goal is to clean the surfaces by lifting off harmful particles and not to clean the house. A common misunderstanding that people have regarding home air purifiers is that they become the repellent to dust mites’ allergies. Although, home air purifiers are designed to capture them so as to make the air cleaner, but if, the mite is present in bed or some other place like a carpet, it is not possible even for the air purifier to perform a task like that. It can be believed to be a big step in fighting dust allergies. Scientific study on air purifiers was once conducted by ‘William Fisk’, to which he gave the title ‘Health benefits of particle infiltration’. His aim was to find out whether the use of home air purifiers would reduce the symptoms of asthma and dust allergy in people exhibiting them. The results turned out to be in his favour. People involved in the study reported that there was an improvement in their health after they started using air purifiers. Thus, it is probable that the use of home air purifiers will improve the living of people. Now you are fully aware about how much useful home air purifiers can be for you. It is also unequivocally required knowing about the types of air purifiers available. Air purifiers with HEPA filters are designed in a way that they can gather particles as small as 0.3 microns (0.0003 mm) in diameter, which can’t be seen through naked human eyes. The speciality of the HEPA filter is that it can be removed and replaced. It is easily washable (with water) and reusable. This type of Purifier works on the principle of electromagnetic attraction. It can pull air pollutants with the use of static electricity. It creates a cloud of free electrons and through which dust particles are forced to pass. As the dust particles are passing through the plasma, they become charged. Charged dust particles are easy to collect. The efficiency of electromagnetic filters is collecting particles as small as about 0.01 microns (0.00001mm) diameter. So, it can be concluded that home air purifiers are definitely a worth to have product. If you haven’t bought it yet for yourself, then you should go for buying it now. They certainly do help in improving the conditions for sure. So, what are you waiting for? Go for it now!